Hello everyone. I know, you must be like WHAT? But yeah, I'm deleting the blog. Let me explain in a second. I feel like no one cares about this blog. So what's the point of blogging? Okay, this is my last post. Don't try to convince me. Goodbye blogging world, it was fun, while it lasted. But before I go, I just wanted to say one more thing. April Fools. Did I get you? Haha, alright let's get into the real post. 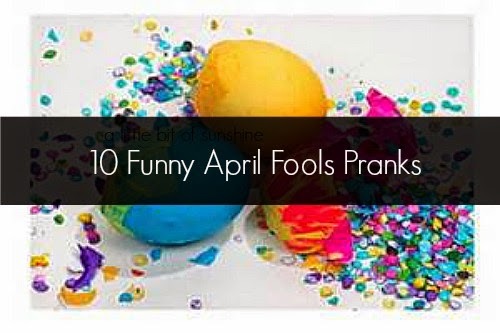 I'll be sharing some fun April Fpp;s pranks that you can try!! 1. Blocking out the remote. If your family is TV crazy like mine, you can take a piece of tape and put it on the front of the remote, so that the remote doesn't work until you take the piece of tape off. This is a fun prank to do to watch your parents or siblings go crazy when they try to use the remote. Bonus: if your parents/siblings ask you to try it, you can sneakily take the piece of tape off of the remote and then it will work like normal so that they will think you're some sort of wizard or genius. Give a little breakfast in bed to your siblings or parents by making a bagel with cream cheese. Add a little toothpaste to one of the bagels for a minty taste! Make sure that you don't add too much toothpaste, otherwise it could be a health hazard. Don't be too pushy for them to eat it, they might get a little bit suspicious. If you ever get ahold of someone's device, you can go to settings and change the language. It's better to do it on an older person's device, since they most likely don't know much about electronics. Then, if you want to, you can text or call and say April Fools! and then give directions on how to change it back. 4. Switching around someone's clothes in their drawers. When I go to get ready, I usually just drift off and pull things off the hangers because I know exactly where everything is. A good way to prank someone (or me) is to switch the shorts around with the jeans or something like that. It will only work for lazy people who never pay attention, but nowadays, that's like everyone. 5. Replacing conditioner with lotion. Oh yeah, somebody pranked me with this one once. They look exactly the same and feel almost the same, so you shouldn't really have a problem. 6. Telling people that you're deleting your blog. This will probably work! Unless they read my blog, then probably not. But still, it would be funny, and slightly heartbreaking. APRIL FOOLS! I told you there would be 10, but there's only 6, ha! That and I can't come up with anything else. Well, I hope you enjoyed today's post and that you don't hate me forever now. Do you have any April Fools pranking stories? Share them down below! I was waiting for someone to do this. I knew it couldn't be true, and if you did try and quit I'd just start a petition on something to get you back to blogging. Great post by the way, I might try the remote one. Wow, I got scared that you were really deleting your blog!!! Whew, I am so happy that was a joke! This morning I put a very real looking, rubber egg in the egg carton, and my mom was fooled. She took it out to make scrambled eggs, not knowing that it was not real! :D But she did figure it out eventually (don't worry, no burning rubber). Whew. Wow, Noor, seriously, YOU SCARED ME!!!!!!! Goodness. Hehe I'm evil. >:D That's a funny prank!! But yeah, sweet post! The remote one also works with mouses (putting tape on red blinky thing on mouse) which disables it. Well, I filled a bowl halfway up with water and put it in the freezer, and left it overnight (I made preparations ehehe). In the morning I poured some milk over it and sprinkled some cornflakes over it, then gave it to my sister. She broke the spoon...heh. Love all the ideas. The toothpaste one reminds me of the trick my sister played on my dad. We had some leftover wasabi from sushi and she mixed it up with some toothpaste, and it was super hilarious!! (If you don't know what wasabi is, it is this really spicy green paste!) Love all the good ideas haha! 😫 You scared the life out of me, Noor! Nice one! I fell for it xD As soon as I saw the blog intro in my feed, I panicked and was thinking about spamming your instagram while I read the rest of the post. You really scared me there! Awesome ideas, I tend to go down the boring route with holes in straws or switching sugar for salt...I ought to be more adventerous like you! I LOVE your blog i got the inspiration for my blog from yours! Check my blog out i only have two posts but whatever!